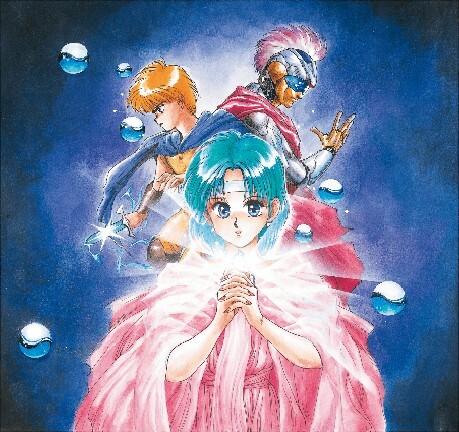 This artwork was designed for the front cover of Phantasy Star Gaiden. Minina is front and center, which is appropriate given her large role in the story. Alec and the android Dalos, who are also playable characters, are also featured. Oddly, for this picture the characters do not quite match the colors used in most of the other official artwork for the game. This illustration was partly designed to entice new players unfamiliar with Phantasy Star to buy the game. Do you think it would have been successful in this task if the game had been released outside of Japan?